Blurb Turbo Charge Your Spectrum! 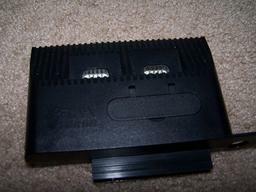 Notes ROM cartridge slot that took the Sinclair cartridge games such as Jetpac, Cookie and Horace. The twin joystick ports could support Kempston (the rightmost one), Protek(Cursor) (the leftmost one, after programming) or Sinclair (both). Hold down the Joystick's fire button on boot to activate Protek(Cursor) mode. A small reset button on the side was available on units produced from Christmas '85 onward.